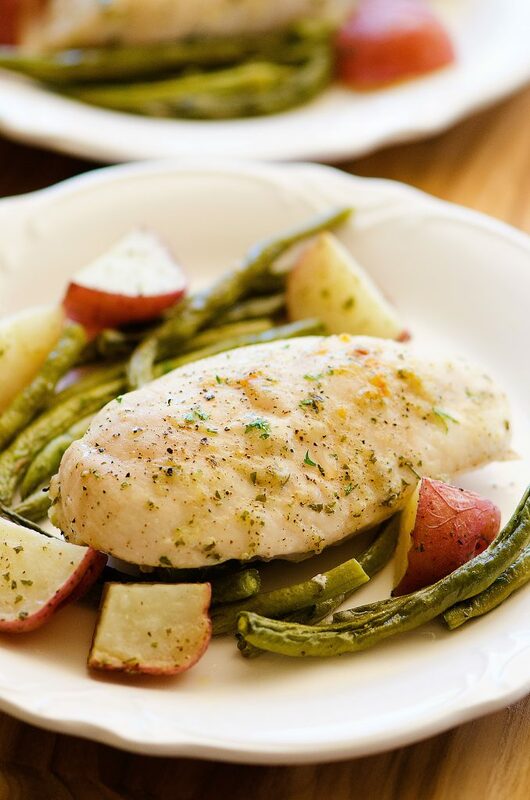 Dinner time just got a whole lot easier with this One Pan Ranch Chicken & Veggies meal! With Hidden Valley® Original Ranch® Salad Dressing & Seasoning Mix, and a few simple ingredients, you are on your way to one delicious dinner! When the kids get home from school it can be a crazy time of day for families. I totally get that! With 3 kids myself and their homework, laundry, etc, life can get busy fast. That is why I LOVE recipes like the one I’m sharing today! 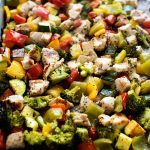 This ONE PAN RANCH CHICKEN & VEGGIES is heaven sent for parents. It’s a great weeknight dinner solution with the help of Hidden Valley® Original Ranch® Salad Dressing & Seasoning Mix! You can turn a few boring pieces of chicken and vegetables into one flavor-packed dinner without using a bunch of different ingredients. Hidden Valley® Original Ranch® Salad Dressing & Seasoning Mix gives any meal loads of great flavor without any fuss. One more reason why I love the stuff! 🙂 This meal-in-one is not only yummy, but healthy, too. Score! To start, dice up a pound of each baby red potatoes and freshly trimmed green beans then add to a large bowl. Sprinkle in half of a 1 ounce packet of Hidden Valley® Original Ranch® Salad Dressing & Seasoning mix and a drizzle of olive oil. Toss to coat all those great flavors together. Lay coated veggies out evenly onto a large greased baking sheet. Using the same bowl as the veggies, add the chicken breasts and a drizzle of olive oil. Don’t forget to “Hidden Valley It” by dumping in the rest of the ranch seasoning mix all over the chicken! 🙂 Gently toss to coat then lay the chicken breasts over the veggies in the pan. That’s it! 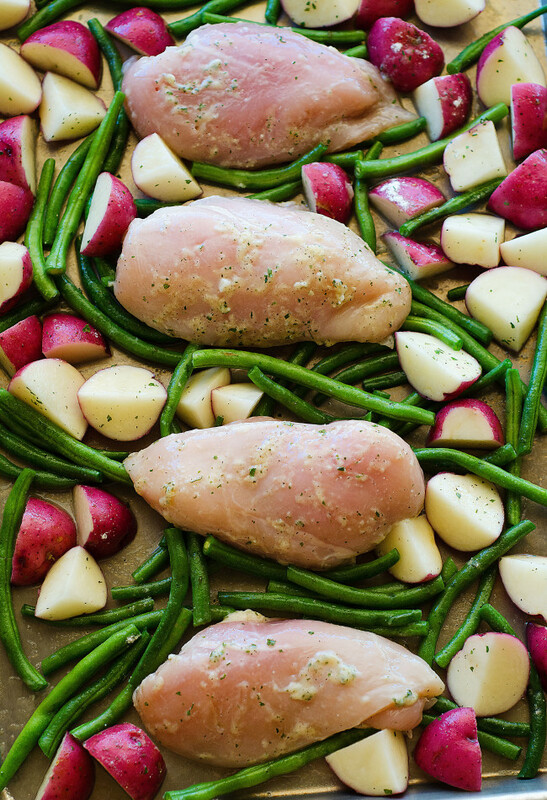 Now pop it in the oven, and bake it for 45 to 50 minutes until chicken is cooked through and veggies are tender. Super easy, super simple, and of course super delicious! 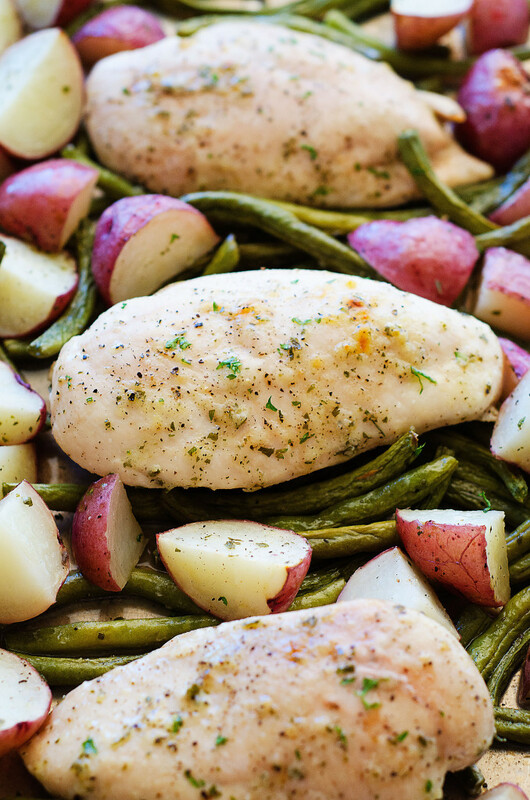 Tender chicken and veggies loaded with flavor from Hidden Valley® Ranch seasoning! Preheat oven to 375° F. Grease a large baking sheet with non-stick spray. In a large bowl combine diced baby red potatoes and trimmed green beans. Dump half of the ranch seasoning into the bowl. Drizzle with 2 Tablespoon olive oil. Gently toss to coat veggies. Lay coated veggies onto the prepared baking sheet in one even layer. Add the chicken breasts to the bowl the veggies were in. Dump the remaining packet of ranch seasoning and olive oil over chicken. Gently toss to coat chicken. 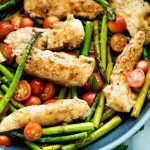 Lay chicken breasts over veggies in pan. Cover pan with foil. Bake 45 to 50 minutes, or until chicken is cooked through and veggies are tender. I am beyond excited that Hidden Valley® Original Ranch® wants to give a $100 Visa gift card to one of my readers! 🙂 How cool is that!? Just follow the instructions below to enter! GOOD LUCK TO EVERYONE! Entry Instructions: No duplicate comments. You may receive (2) total entries by selecting from the following entry methods: 1. Leave a comment in response to the sweepstakes prompt on this post 2. Tweet (public message) about this promotion; including exactly the following unique term in your tweet message: “#SweepstakesEntry”; and leave the URL to that tweet in a comment on this post 3. Blog about this promotion, including a disclosure that you are receiving a sweepstakes entry in exchange for writing the blog post, and leave the URL to that post in a comment on this post 4. For those with no Twitter or blog, read the official rules to learn about an alternate form of entry. This giveaway is open to US Residents age 18 or older (or nineteen (19) years of age or older in Alabama and Nebraska). Winners will be selected via random draw, and will be notified by e-mail. The notification email will come directly from BlogHer via the sweeps@blogher email address. You will have 2 business days to respond; otherwise a new winner will be selected. The Official Rules are available here. This sweepstakes runs from 11/23/2015 – 12/30/2015 Be sure to visit Hidden Valley® Original Ranch® brand page on BlogHer.com where you can read other bloggers’ posts! Who doesn’t love Ranch and who doesn’t love quick and easy! I can’t wait to try this new recipe for a Ranch chicken dinner. thank you for this yummy recipe …. I’m enjoying your daily emails …. I’m looking for your “bacon ranch pasta salad” … can you help me please ? Love the sounds of this recipe!!! All of the ones I’ve tried have been AWESOME!!! This one will be to. Making this for dinner tonite! I love easy, fast and delicious recipes! 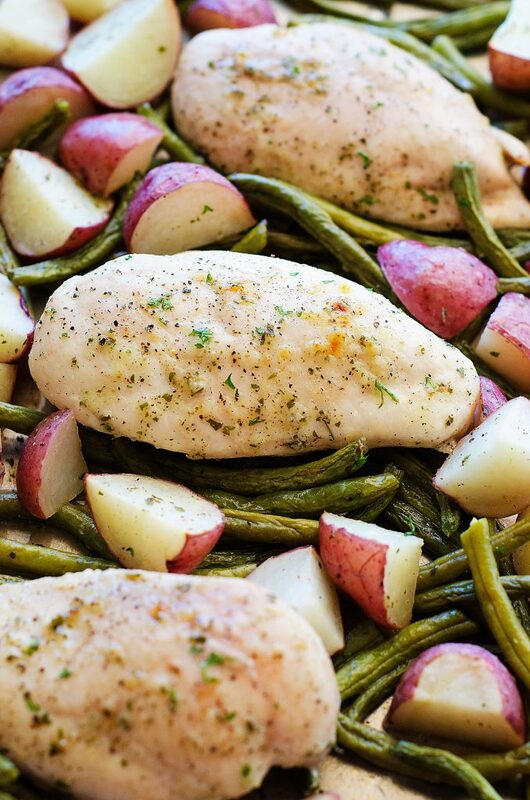 This One Pan Ranch Chicken & Veggies sounds yummy. I look forward to trying it! This looks great and I love doing 1 pan dishes! Pinning and trying soon! Anything with ranch is great! Love all the things that you create! Have a great holiday! I love one pan/skillet meals! Makes cooking and cleaning super easy. Thanks! Holly, I have loved everything I’ve made from your blog. Simple, delicious, can’t-miss dishes is just what I need for our schedules. Thanks a million! this looks outstanding. I definitely want to make this for dinner. This recipe looks great. I would also like to try the Crunchy Baked Ranch Chicken from their site. This sounds like a simple and healthy meal my whole family would love. Thanks for sharing! This sounds right up my 15 year old daughters alley!! She loves anything ranch! I love Hidden Valley and I love sweepstakes ! Thanks for the chance to win! I love the one pan meal. I’ve done potatoes with Hidden Ranch and the family loved it. This will also be somthing that appeals to all. 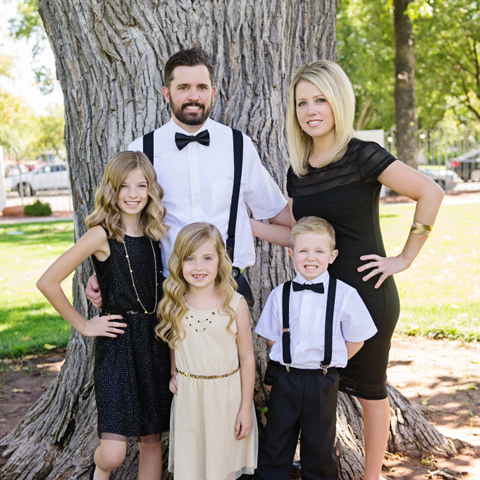 Love your blog Holly! Thanks for a chance to win the sweepstakes! This recipe looks amazing and so healthy. I went to the Pinterest site and I want to try the Hidden Valley Ranch crispy chicken recipe too. It looks like a yummy recipe. This sounds and looks delicious!! I love one pan meals! SO easy! I love Hidden Valley Ranch! It’s the only Ranch allowed in this house! I love to make their seasoned oyster crackers. So delicious!! This sounds amazing!!! I’m going to make this for Sunday’s dinner!!! I love your recipes! We’ve tried several & can’t wait to try this one! This looks like such a quick and tasty meal. Hidden Valley seasonings really add a lot of flavor. I like one pan meals because it means less clean up! I think that ranch really adds a lot of flavor to both chicken and veggies!! Potato with chicken and green beans, this looks delicious and perfect to serve for Thanksgiving dinner. This looks like a great recipe! I love one pan meals too! I love your easy recipe and I am going to make it. I love using Hidden Valley Ranch dressing for so many of my recipes because they add so much flavor. I like your recipe. I would try the I would make the Buttermilk Ranch Potato Gratin recipe. 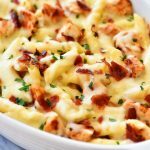 I usually love your recipes and love ranch, so this would be great to try! This dish looks splendid, I bet my kids would gobble it up! It would be great even for a busy night of sports or school work. I posted a tweet: https://twitter.com/FireRunner2379/status/671060903593398273. The roasted cauliflower sounds yummy. I use Hidden Valley Ranch for so many of my meals, it is the only ranch my house will use. I have a lot of this on hand already and can’t wait to try this idea! Your comment entered you! Good luck! I love to use Ranch on Buffalo Chicken Sandwiches! Yum! I love the combination of ranch with chicken. It looks and sounds delicious. That is amazing! The recipe looks good too! I’m making a sheet dinner tonight as well! What a tasty recipe! I would use the dressing to make a marinade for some chicken breasts. I would sprinkle it on oven roasted potatoes! I’ve only recently discovered the joy of the sheet-pan supper. This one looks great! Thanks for the recipe–I’ll keep an eye out for a good buy on green beans to make it. I like my Hidden Valley Ranch on my Cobb Salads! I have a one pot meal with pasta – the pasta cooks in liquid with veggies, etc, that we love! We love ranch flavoring in our house. 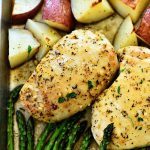 I’d like to try out this recipe for a one pan meal! HIDDEN VALLEY RANCH… CANT GO WRONG! I like the Hidden Valley Original Ranch Salad Dressing on salad and with Chicken Nuggets on football day. Looks delicious ! I love one pan meals ! This looks like a meal that my whole family would eat. This recipe looks like it would be a hit with my family and with four kids I am always looking for quick and simple! I just bought the Hidden Valley packets today so I will be trying this tomorrow! I use it to flavor pot roast cooked in the slow cooker. It gives it a great taste and I add potatoes and carrots. It’s about the only way to get my kids to eat some veggies. I do not see an actual sweepstakes prompt anywhere on your post, so I will just comment on the post itself. I hope this is OK! This looks so good and would be super easy to make vegetarian, too! Def gonna try it! Looks good! Thanks for the recipe and giveaway. My kids would enjoy this. They like a salad I make using ranch and it is a macaroni salad having ham, cheese, mayo, ranch and a few other things in it. I am a big fan of one pan meals for my family. In addition, I have so many uses for Hidden Valley® Ranch seasoning mix from roasted potatoes to chex mix. Our whole family would love this recipe. That recipe looks delicious! The ranch flavor sounds great. Your chicken dish looks so good! I’d like to try the crispy chicken recipe on their pinterest page too! This looks wonderful. 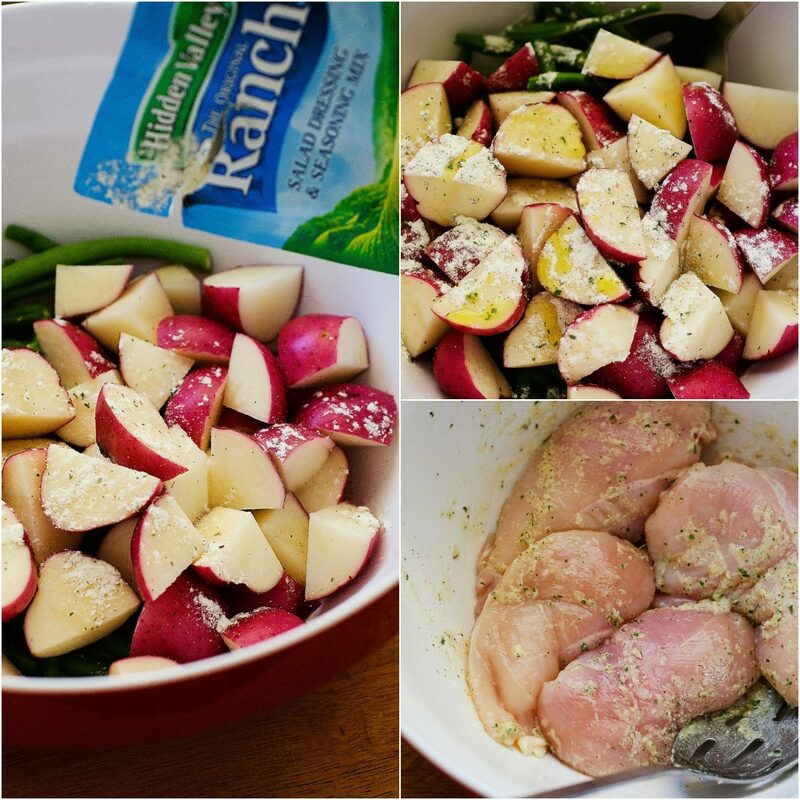 I’ll definitely be making this one pan meal soon, especially since it is made with Hidden Valley ranch mix. So good. This looks so delicious and reminds me of a meal I use to eat regularly when I was in college. I think I need to revisit it with this updated version. 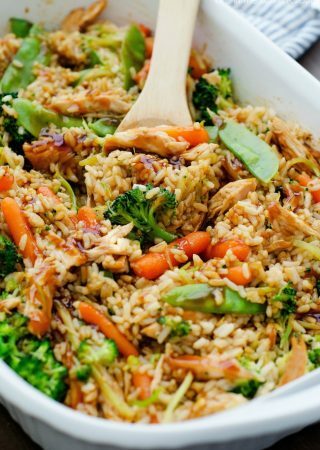 I’m always looking for easy quick meal recipes and I have to try this one. It sounds super easy and really yummy. Can I substitue asparagus for the green beans? Yes that would be delicious!